World War II is a big part of what I teach. It is also a big part of who I am as a person and as an American. That's why I knew, once I was hired for a three-week stint in New Orleans this summer, that one of my first stops would be the National World War II Museum. I'm not your typical World War II buff, although both of my grandfathers served in that war. My Grandpa Dittes volunteered to serve in the Army as a doctor, eventually going to Australia and New Guinia with the 808th Engineering Batallion. My Grandpa Mooney, who had served in the Navy during World War I and was working in New Orleans at the time as a kind of "sea-traffic controller" for the port there was given responsibility over routing shipping in and out of ports all along the Gulf Coast. I'm not your typical World War II buff, even though I teach a two-month unit on the conflict every March and April. I teach German II. I take that to mean that students should understand how Germans could have allowed the Nazis to take over, and it also means that I should show what the war was like for Germans. We cover the Eastern Front, the Fall of Berlin, and the terrible refugee crisis that followed. It balances out the view of WW2 they will get in U.S. History the next year. I"m not your typical World War II buff. I am a pacifist. And I see World War 2 as the outlier--the "good war" that led America into countless boondoggles since then, with an enemy so captivating that American leaders will be selling war another 75 years from now by comparing opponents to Hitler. 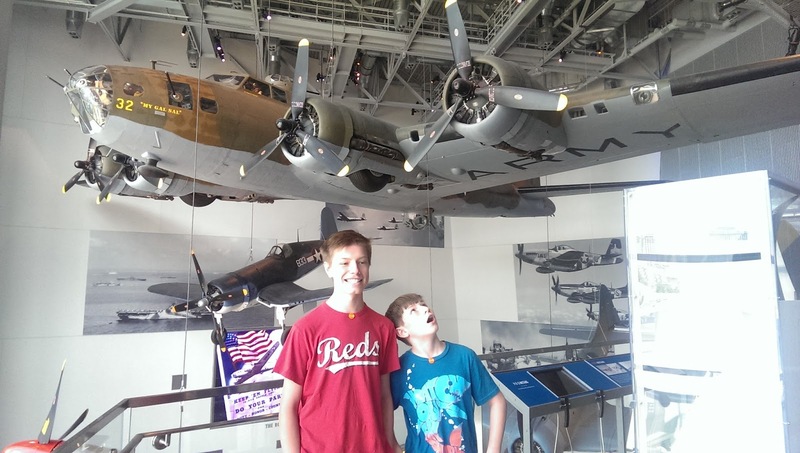 I'm a World War II buff, which means that I toured the NWW2M twice: once with a teaching colleague and a second time with my two sons, ages 15 and 12. This gave me two great opportunities to experience the museum, and some definite fascinations and opinions about what I found there. Before I went, a local New Orleanian had described the museum as a place under constant construction. 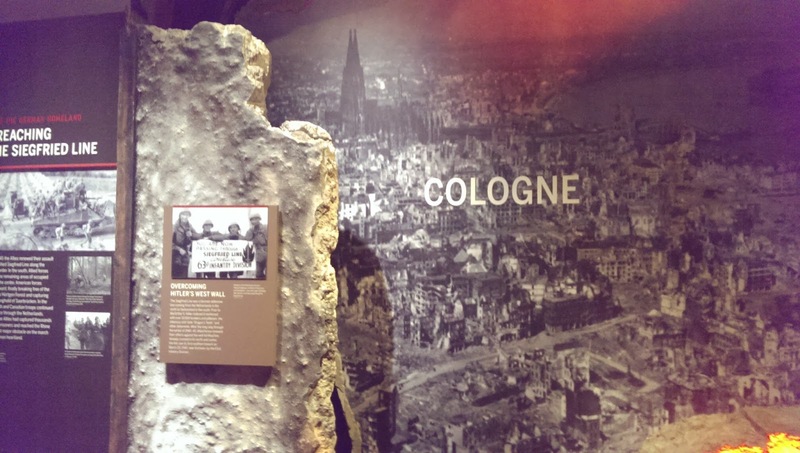 There is plenty of construction going on, but I found a full experience there, a state-of-the-art museum that provided a multi-sensory look at the war, with a determined focus on the lives of the men who waged the war. The construction made things a little confusing. Walking over from the trolley stop on Lee Circle, you have to cross a very busy Camp Street (one block from an interstate off-ramp), then walk around the block to the entrance on Magazine. After purchasing tickets, the museum has a really cool introduction to the exhibits. Visitors are given a "digital dog tag" and escorted into a passenger train car. There we watched a video that captured the feeling of young men from across the nation who left their homes to go to war. This experience really captured the theme of the museum: this was a war fought by real people, just like you and me. My boys were really fascinated by their dog tags. After the film, they had time to hold their card next to the display and watch an introductory film about their assigned soldiers. Through the rest of the exhibit, there were four more stations/screens where the boys could follow their soldiers' progress through the war. We crossed two elevated crosswalks to the building that held the historical exhibits of the war. The top floor holds the Road to Berlin exhibit, following America's entrance into the war. I think most Americans think of D-Day as the central event of the war in Europe, but that battle took place 2 1/2 years into the war. The exhibit marked a clear timeline, showing how Americans worked their way across North Africa--taking a couple defeats along the way as they learned to fight the Germans--and then hopping across the Mediterranean into Sicily and then into Italy proper. Each of these steps required amphibious landings, and they built up a level of expertise that would pay off on June 6, 1944. The D-Day Room was well laid out, with a 10-minute video vividly showing paratroopers and the battles on the beaches. The museum had a good balance of videos, artifacts and cool set pieces (one room looks like the bridge of a destroyer, another has "holes" in the ceiling like it is a bombed-out hangar. 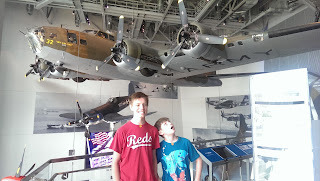 The boys and I were really intrigued by exhibits on the air war. 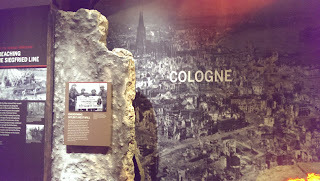 One gets a sense of awe at the sheer scale of the destruction that the air war wrought on German cities. The photo below is one I snapped inside the exhibit. 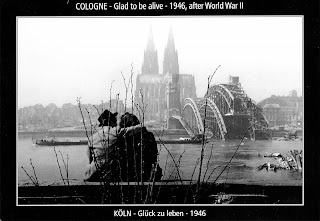 It shows Cologne, one of Germany's most beautiful cities, almost totally flattened, and the miraculous survival of the Cologne Cathedral adds a bit of dignity to the scene. Now it so happens that my sons and I got to visit Cologne over spring break. At the front of the cathedral, they had a display of the bombed-out city and the damaged cathedral left over from last year's 70th anniversary of the end of the war. ...I know it now. It's people. 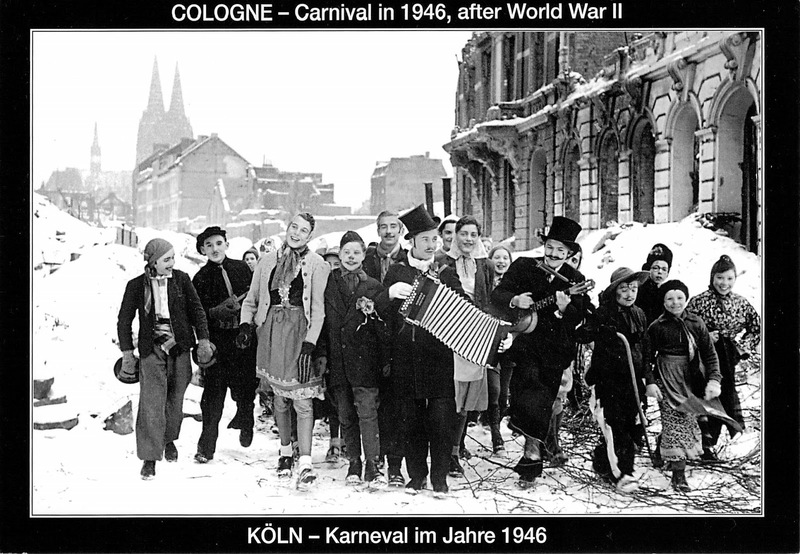 There are actual German people in the Cologne postcards. The exhibits--particularly regarding the air war--were free of those left living among the rubble. This is probably where the biases I mentioned at the beginning might come in. I teach German. I'm a pacifist. If we could see what war does to its victims--civilian and military--if we could really see it. No person would ever support a war again. The NWW2M did a great job of seeing the war's horrors and challenges from the view of a GI, but it sanitized the results of those GIs and airmen's own onslaught. I discussed this with the boys. There was another element to the Road to Berlin that my friend, Kathy, noticed. The room that shows the Battle of the Bulge has lots of snow imagery. It is colder, too. We shivered in our summer shorts and T-shirts. "I wonder if they did that on purpose," Kathy asked me. We laughed. They probably did. The B-17 in the picture above has a fascinating story. "My Gal Sal" never saw action in World War II. Instead, it crashed en route to Europe on a glacier in Greenland. Every member of the crew survived, but the plane was left behind. In 1995 it was restored--an amazing story in itself--and later it was donated to the NWW2M. It is so neat to get up close to a B-17 and look inside all the windows. The film, Beyond Boundaries was a nice change of pace for us. The movie is billed as "4D," which in this case means an extra-wide screen with cool graphics and props that descend from the ceiling or rise up from the floor. For example, the coolest bit, for me, was when a fuselage of a B-17 was lowered before the screen while the movie showed an air battle all around it. Snow fell on the audience during a clip on the Battle of the Bulge, and there were many other special effects for a 45-minute showing. Most importantly, it emphasized many of the themes the boys and I had seen in our tour of The Road to Berlin, making it more likely we would remember them. (Another option is the Final Mission: the USS Tang Experience, an interactive program about submarine warfare.) The multimedia events are a pretty good deal, just $5 more added to the admission ticket. For lunch we elected to walk a little ways down St. Charles Street to a Raising Cane's fast-food restaurant. It gave us a chance to talk about what we had seen. We talked about the missing civilians in the exhibits, and we talked a little about how the war had ended. Owen's soldier had been a really brave guy. He had won a Congressional Medal of Honor just after D-Day. Jonah's soldier, Paul Tibbets, had started in the European Theater as a pilot, but he had been transferred to the Pacific Theater. We would learn a lot more about him later. 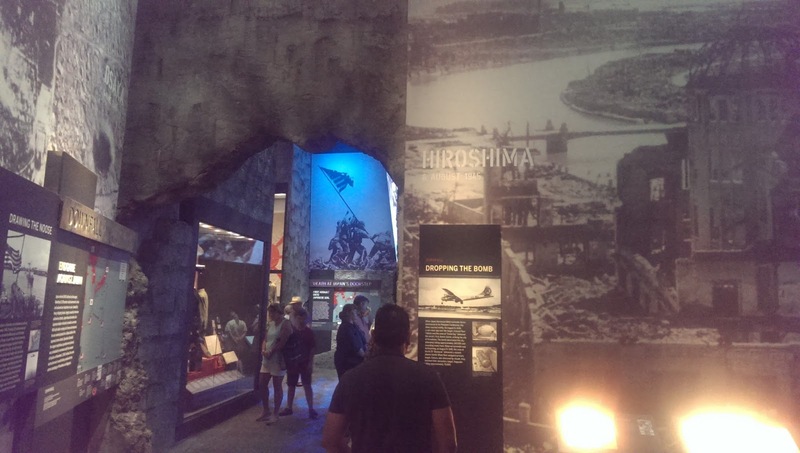 The bottom story of the Campaigns of Courage Pavilion contains exhibits on the Pacific Theater. It began in a mock bridge of a ship, and it really gave me a perspective of the naval war at the center of the island-by-island conquest of the Japanese Empire. I learned a lot more about the battle for Guadalcanal here than I had understood before. I was also surprised at the level of detail the museum provided for the airlift of supplies to China. But civilians were missing again. The only view of civilians I saw was of images of Japanese committing suicide on the cliffs of Saipan. Of course, this leads to the explanation of the Big Event that ended the war against Japan. The exhibit on Iwo Jima is moving. It is harrowing to see the flamethrowers and to imagine Japanese soldiers hiding in caves, fighting to the last breath. Japan seemed to have a national suicide pact. The Army ordered half a million body bags. Just outside the final room, Jonah swiped his "dog tag" and learned that Paul Tibbets had flown the Enola Gay bomber on his historic mission over Hiroshima to drop the first atomic bomb. We walked into the Hiroshima to find a huge ruin-scape covering three walls. Glass bottles melted by the explosion. No bodies. No civilians. We learn facts about the nine Americans who flew the Enola Gay. We learn nothing about the 140,000 Japanese who died in the holocaust they unleashed. In fact, I was pretty impressed at the way the museum had set up Hiroshima. In the picture below, when the viewer looks back through the entrance of the Hiroshima Room, what does she see? The huge photo of Marines on Iwo Jima, that terrible killing field. It is a subtle reminder. "We were right. We had to do this thing." I don't believe in rewriting history or second-guessing Harry Truman or fantasizing about alternative endings to the war. I grew up in America. My school books taught me a saccharinized history of Hiroshima and Nagasaki. It wasn't hard to learn the truth. It wasn't censored, just suppressed. I don't mind the excuse, "We had to do this thing," as long as we understand that the "thing" we did was terrible, inhuman, devastating. The National World War 2 Museum is a fascinating place. A state-of-the-art museum that packs the punch of Washington DC's National Holocaust Museum in its attention to detail and in the way it individualizes the war for its visitors. There is much to learn there.